Reporting on its fiscal 2015 third quarter financial results, Apple has announced net profits of $10.7 billion ($1.85 per diluted share) on revenues of $49.6 billion, exceeding the analyst consensus estimate of $1.81 per share in earnings. The company’s revenues are up 33 percent (an increase of $12.3 billion) compared to the year-ago quarter, the fastest growth rate in three years (see “Apple Q3 2014 Results Show Highest EPS in Seven Quarters,” 22 July 2014). Apple realized 64 percent of its revenues from international sales. Despite these impressive financial results, Apple’s stock price fell over 8 percent in after-hours trading (but is still near its all-time high). Apple certainly shouldn’t be worried about what the market thinks in the short-term — the company now boasts over $202 billion in its money pit. Apple’s stack of cash is almost equal to Greece’s GDP. Apple continues to be cagey about Apple Watch sales figures, burying them in the miscellaneous Other Products category, which had total revenues of $2.6 billion, but CEO Tim Cook maintains that the Apple Watch is off to “a great start.” Revenue in Other Products was up by 49.5 percent year-over-year, and CFO Luca Maestri said that Apple Watch was responsible for over 100 percent of the category’s growth, but that’s comparing apples and oranges, since the Other Products category didn’t include iPod sales until Q1 2015 (see “Big iPhones Mean a Big Q1 2015 for Apple; Apple Watch Date Revealed,” 27 January 2015). Maestri said that Apple is choosing not to share specific Apple Watch numbers so as to not help competitors, though it’s unclear why that would be important for the Apple Watch but not, say, the iPhone or iPad. Nonetheless, Cook gently contradicted reports that Apple Watch demand is declining, stating that June sales of the watch were higher than those in April and May. In fact, Cook said that so far, the Apple Watch is outselling both the original iPhone and the original iPad at the same point in their lifetimes. He did, however, emphasize that Apple is less focused on initial sales, and is choosing instead to focus on a great customer experience. “It’s such a rare privilege to launch a new platform with such potential,” Cook said. As has become commonplace, iPhone sales continue to skyrocket, with a year-over-year revenue increase of 58.8 percent. Cook bragged that the iPhone is seeing the “highest switcher rate from Android ever measured.” He said that 86 percent of customers planned to buy another iPhone, compared with 50 percent for the next highest brand measured. The iPhone saw an 87 percent unit growth in China, compared to IDC estimates of a 5 percent unit growth for the entire Chinese smartphone market. The Mac continues to climb the charts, with year-over-year revenues increasing by 9 percent — this in the face of IDC estimates that the overall PC market had contracted by 12 percent in the third quarter. Mac sales grew by a whopping 33 percent in China. However, the iPad sales volume continues to decline, with a year-over-year revenue decrease of 22.9 percent. Cook said that he’s still bullish on the iPad, citing both the new iOS 9 feature enhancements and increasing enterprise adoption. Helping spur that adoption, Maestri said, was the success of the IBM partnership, with some 35 enterprise apps already released, and with 100 scheduled to be available by year’s end. Cook also noted that iPad usage is more than six times that of competing products, which bodes well for eventual upgrade sales. Maestri remarked that, of those surveyed, over half who intend to purchase a tablet in the next 90 days are choosing the iPad, and over 70 percent of enterprise purchasers are also going with the iPad. He added that Apple doesn’t compete in the sub-$200 end of the tablet market, but has a 96 percent share of tablets outside that price range. 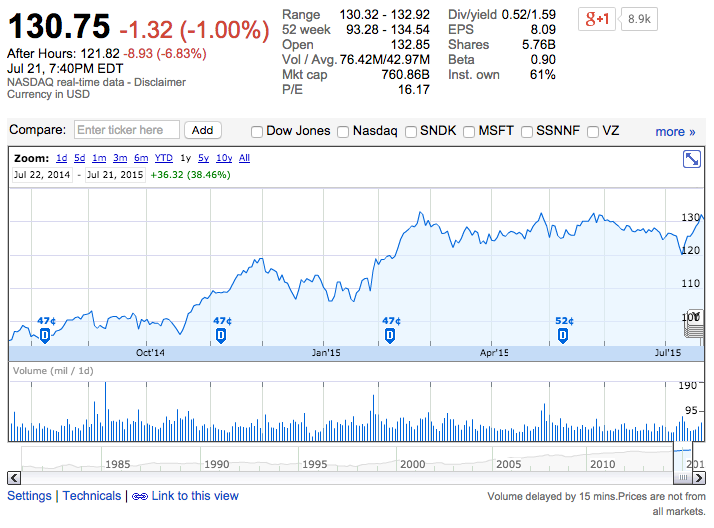 Apple raked in over $5 billion in services, a new all-time high, up 12 percent year-over-year. App Store revenue grew by 24 percent in the quarter. Apple Pay seems to be doing well, with a quarter-million locations for last week’s UK launch, Square Reader support in the fall, and upcoming Apple Pay support at over 700 colleges and universities, including Auburn, Colorado State, the University of Kentucky, the University of Oklahoma, and UC Irvine. American Express will also be adding Apple Pay support for corporate cards next month. While the Apple Watch sales volume remains a mystery and iPad sales are flagging, Tim Cook’s Apple is still going strong. Apple can’t possibly maintain its stratospheric growth forever, but it shows little sign of slowing down anytime soon. So, Apple Watch sales are at least $850m, but probably substantially less than $2600m So, that's equivalent to at least 2.5m of the cheapest model. That seems pretty good for a short period of sales, and low international availability. Much of Europe, for example, can't get it. My guess is that they're selling everything they can build. The iPad is slumping on part because they are incredibly durable. I've got two iPads, one of which is the very first model that was released. Despite being stuck at iOS 5x, it does almost everything my much later other iPad does. Same applies to six year-old MacBook but that one is running the current OS X perfectly. I think that people will continue to want an iPad - they're just so well made that they are not a "replace every two years" item. But the older models WILL be replaced when newer software allows features that buyers will want. What is the difference between Greece and Apple? Apple has adult leadership and hard workers. It continues to amaze me that Apple can maintain it's market momentum even with the obvious decline in the quality of Apple software, like the bug-ridden OS X 10.10 Yosemite and iTunes 12.2 – along with the half-hearted development of the iapps. 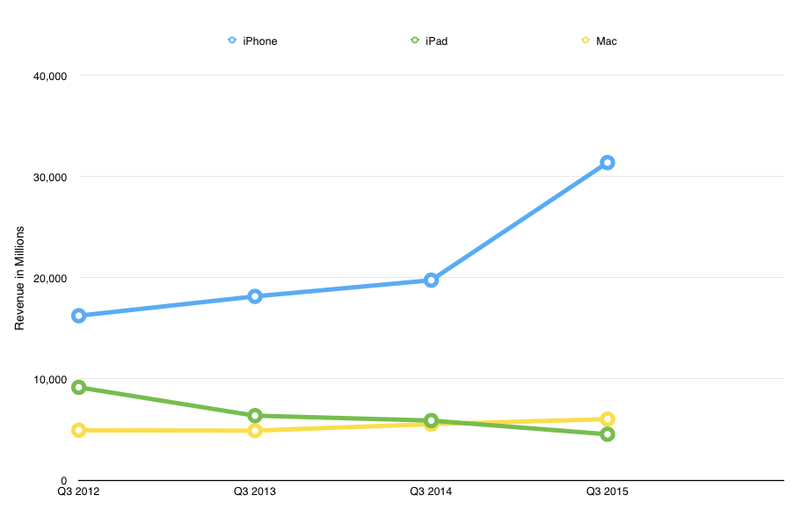 No doubt Apple's persistent success has a lot to do with the quality of the competition for OS X and iOS. If you use either one, despite their flaws, there is no better alternative available. Indeed, most of Apple's worst problems exist only in the overheated imaginations of its die-hard critics, which clearly have not impacted the buying decisions of the majority of consumers. Sadly, the legitimate criticisms of Apple's software have not impacted Apple either. Perhaps they have learned to tune out both the fiction and the truth. I'd like to think that such willful blindness to their own faults bodes ill for Apple's future, but in recent years Apple has simply been bullet-proof, to mix a metaphor or two. I guess it goes to prove the old adage, nothing succeeds like success. Apple's software quality may seem bad to us, but compared to the rest of the software world, it's spectacular. Getting to this article late in the piece, the big story here in Australia is how much of Apple's cash stockpile comes from tax avoidance.